Have you read lately about the benefits of naturally fermented foods? Not only are the probiotics in these foods excellent for the health of your digestive tract, fermented foods are also easier to digest because fermentation helps break down difficult to digest cellulose in vegetables, which means that if there are certain vegetables you avoid because they seem to bother you, it’s possible you can enjoy them again once they’ve been fermented for a few days. Rather than losing nutrients in traditional preserving methods, fermenting your vegetables actually raises the vitamin content! Fermented foods are flavorful and, when stored in a cool place, will keep for up to 8 months, which means that you could be enjoying the produce from your garden or local Farmers Market all winter long! I’m working on getting more delicious, probiotic goodness into my family’s diet, but there are only so many pickles (and so much sauerkraut) a person can eat. 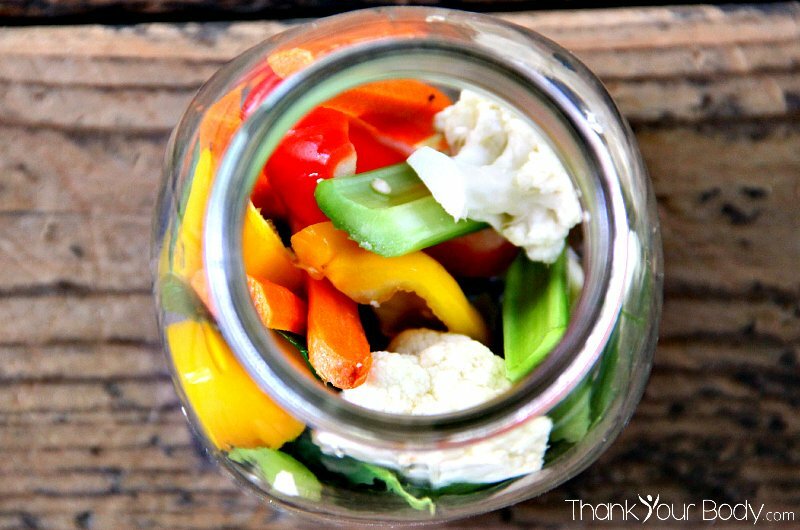 It’s time to get creative with fermented veggies! Naturally fermented pickled vegetable medley is great for a snack, and these tasty pickles can also be used to top a salad or add spice to a sandwich. Dice the veggies up and serve them on top of tacos, or toss them in a food processor with a little cream cheese for a great dip! A splash of the probiotic-loaded brine from these pickles mixed in with a little extra virgin olive oil makes a wonderful dressing for your salad and can add flavor to soups, stews, and other dishes. I’ll be exploring ways to use your fermented foods in everyday recipes, but in the meantime here’s how to make your own vegetable medley…and you won’t believe how easy it is! Start with fresh, organic vegetables at the peak of ripeness. Here’s a great way to wash produce naturally. 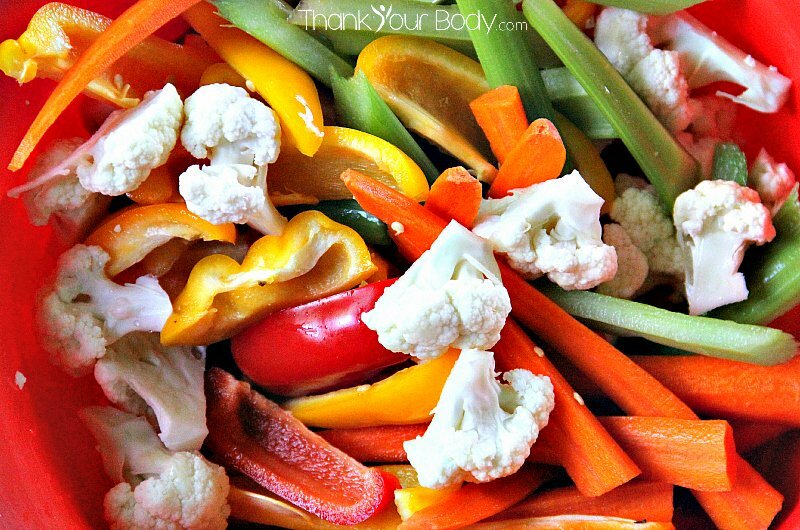 I chose carrots, celery, cauliflower, mini red, yellow and orange peppers, garlic, and a few tiny hot peppers for flavor. To keep the vegetables more crisp, you’ll want a few grape leaves. You can add spices to the mix, such as an organic pickling spice and fresh dill…or leave them out if you’d rather have the veggies plain (this makes them more flexible for adding to recipes). Just wash, trim, and chop the vegetables into bite-sized pieces and then set them aside while you make the brine. Brine is simply filtered water (you’ll want to make sure your water is free of chlorine…you can boil it on the stove top if you don’t have a filter that will remove the chlorine) and sea salt. Mix up a batch in a large pitcher, and if you have any left over you can store it in a jar with a lid for the next batch of veggies! Just pack the vegetables tightly into clean jars, add the spices if you’re using them, and a few pieces of torn grape leaf. Carefully pour the brine over the vegetables, then tuck a grape leaf on top to keep the veggies from floating out of the brine and put a lid on the jars (same easy process as making naturally fermented pickles). Let them sit on your counter for 3-7 days, opening the jars once a day to let the gas escape and check to make sure that no vegetables are floating above the brine. The vegetables will continue to get more sour as they ferment, so taste them after a few days to see if they’re as sour as you’d like. When the flavor is just right, pop them in the fridge or in a cool place…they’ll hold their flavor and will stay fresh for months. Right now, as the growing season is winding down and there are so many great organic vegetables available from the garden and market, my kitchen is looking a little like a colorful laboratory with jars of food fermenting all over the place. I love this stuff! It’s so fun to put food away for the winter, knowing that you’ll be enjoying fresh produce from your garden all year long. Take the healthy power of fermented foods and combine it with these delicious veggies and you have a great side dish. We love serving this naturally fermented pickled vegetable medley. Wash, trim and chop the vegetables into bite-sized pieces. Stir the salt into the water, set aside. Pack the vegetables, garlic, spices (if using) and 1 torn grape leaf tightly into a clean jar. Carefully pour the brine over the vegetables, leaving 1 inch space at the top. Tuck a grape leaf or cabbage leaf over the vegetables to keep them submerged in the brine, then screw a lid onto the jar. Set the jar away from direct sunlight in your kitchen, in a place where it will stay room temperature (it's best between 65 and 80 degrees). Let the vegetables ferment, loosening the jar lids once a day to allow gas to escape and check to ensure that the vegetable are staying submerged in the brine. After 3 days, check to see if they taste sour enough for you...allow them to ferment for up to a week. When the vegetables reach the desired flavor, cap them tightly and store them in a cool place (the fridge or a very cool area in the basement or garage). Once they are cool, the fermentation will stop and they'll keep for up to 8 months. P.S. You may also love these fermented carrots. Do you have ideas about how to incorporate fermented foods into your diet?